Feed my Lambs. 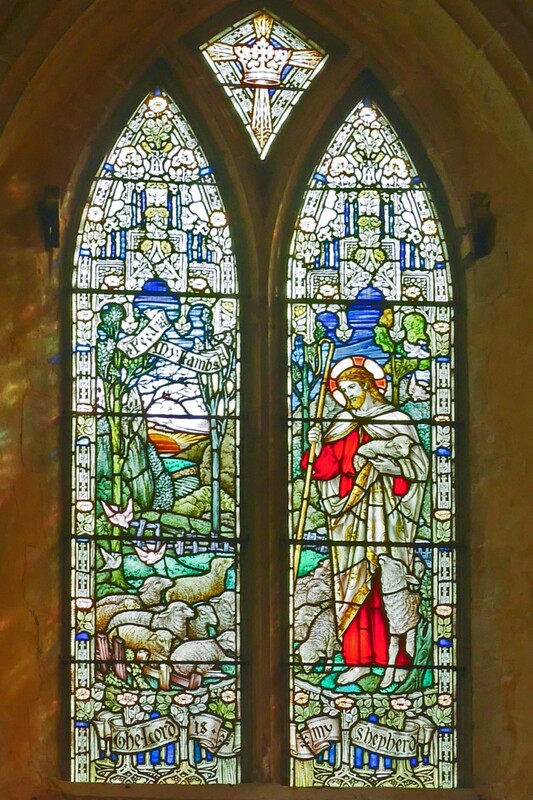 1930's window in Arts & Crafts Style. 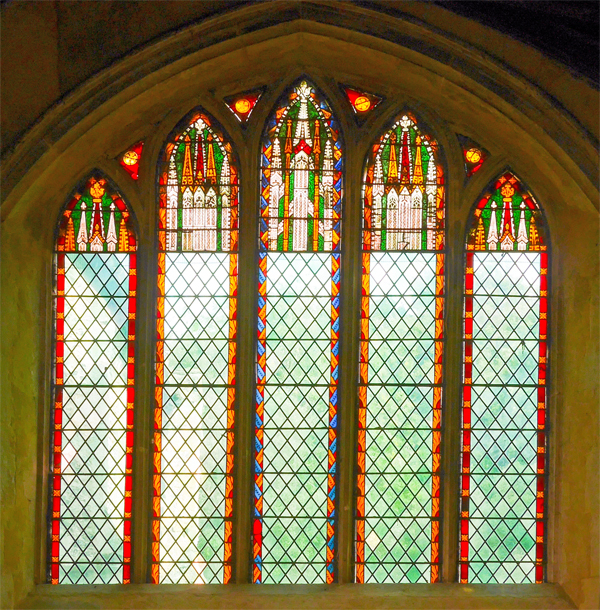 The tracery lights contain “extensively restored” canopies originally made in the first half of the fourteenth century. 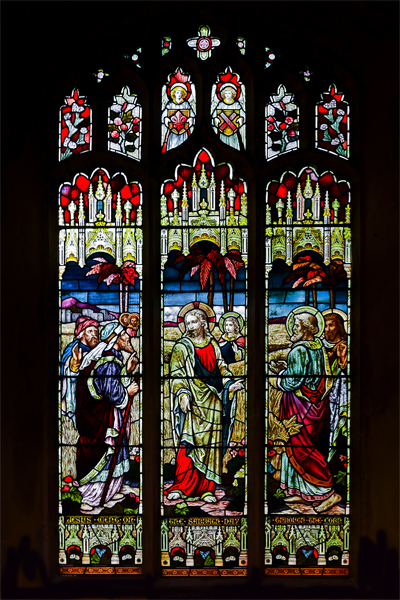 It is believed that originally the five main lights would have contained a full length figure in a rich tabernacle. 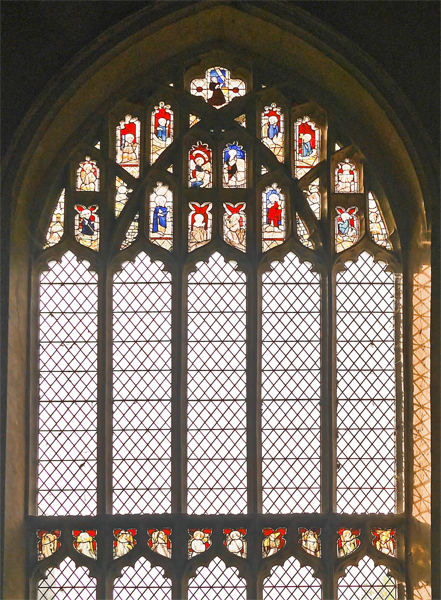 The tracery of this window contains 15th century glass. 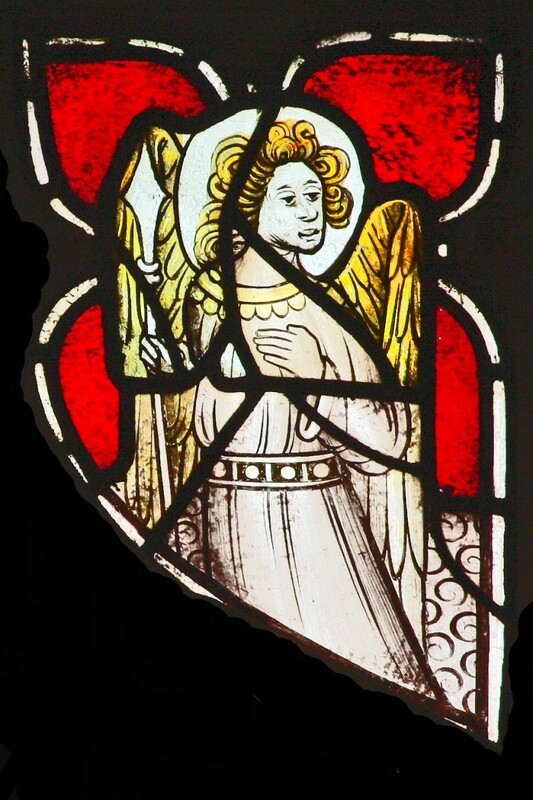 The central feature is an Annunciation scene, below which are the figures of the Royal English saints: St Edmund, holding his emblematic arrow, and Edward the Confessor. They are flanked by St James the Greater and St John the Evangelist, holding a chalice containing a serpent. 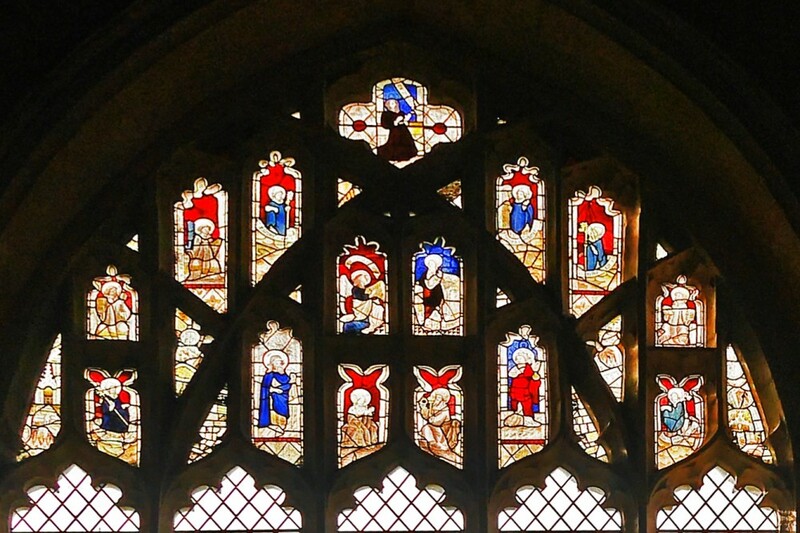 The kneeling figure in the apex of the window represents an unknown donor figure, whilst ecclesiastical saints in their church vestments are depicted in the outer arches. In descending order to the left are: St Ledger (deacon), St Vincent (deacon), St Lawrence (deacon) and St Wilfred (Archbishop). In descending order to the right are St Thomas of Canterbury (Archbishop), St Martin (Bishop), St Stephen (deacon) and St Blaise (bishop). 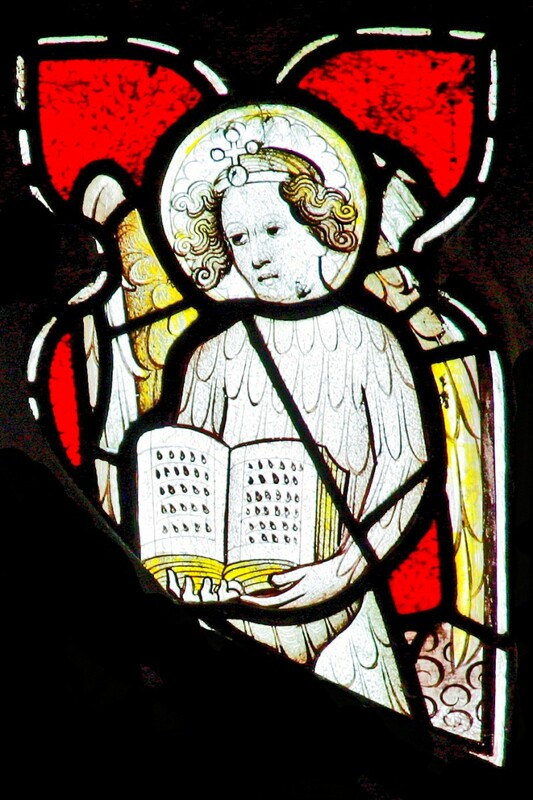 In the small panels below the transom are a series of the Orders of Angels. 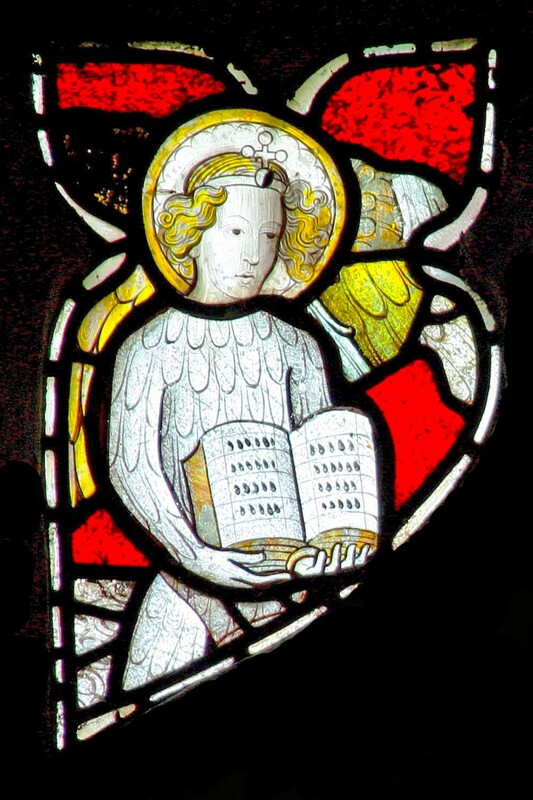 There are ten angels from the three heirarchies, Seraphim, Cherubim, Thrones, Dominations, Virtues, Powers, Pricipalities, Archangels and Angels. Some are holding symbols helping to indicate who they are but we cannot be sure. All pictures are taken from originals © Mike Dixon. Blindfolded and holding scales. 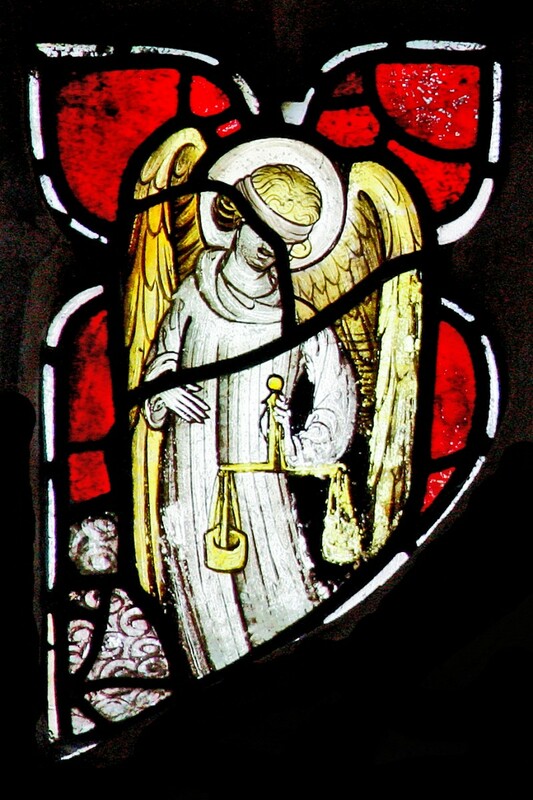 Though St Michael the Archangel can also be shown holding scales to weigh souls. 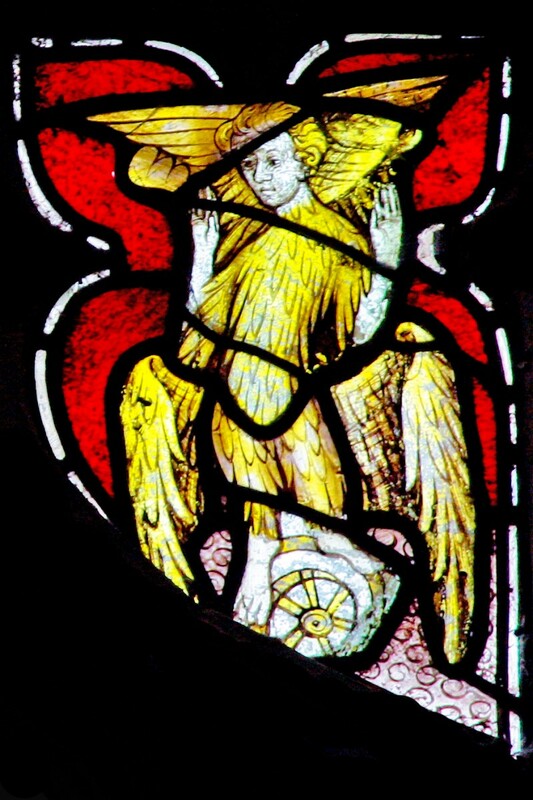 Depicted with a crown and carrying a Sceptre. 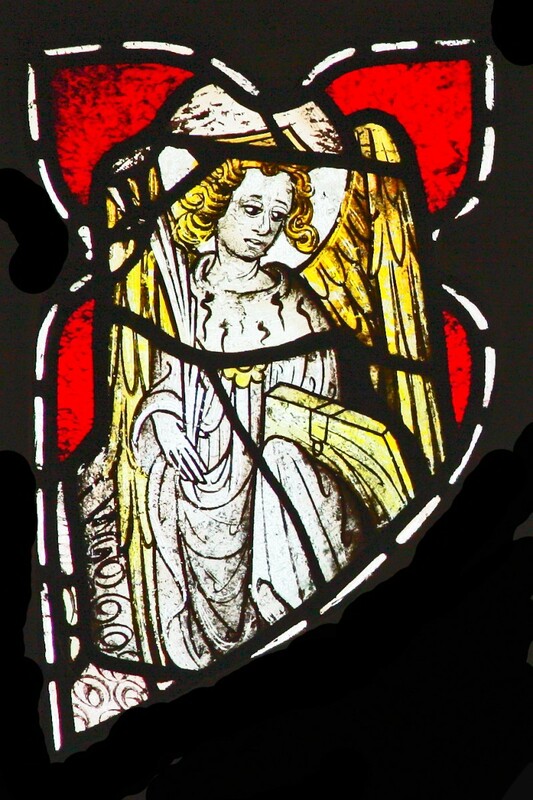 Thrones are often shown with a thrown - is that a throne this angel is sitting on? 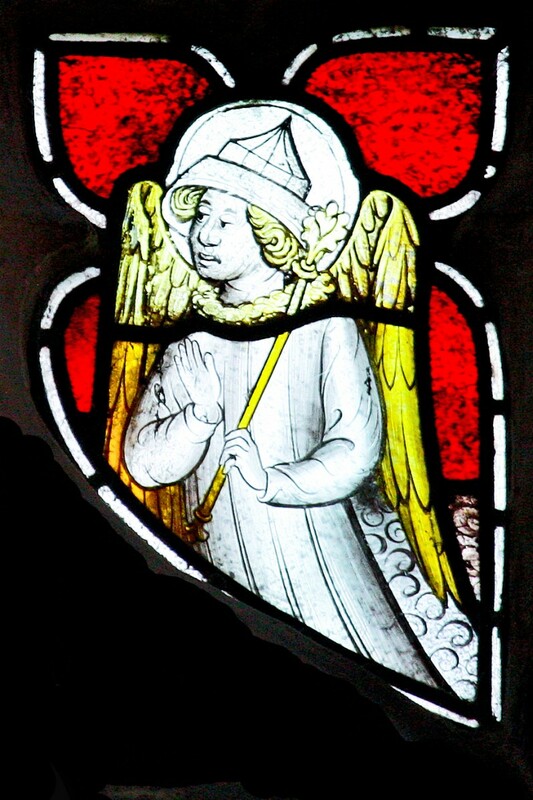 Could this be St Michael the Archangel. The warrior angel with a spear? Holding a book representing "the knowledge of God." Like Cherubims can aslo be shown holding a book. 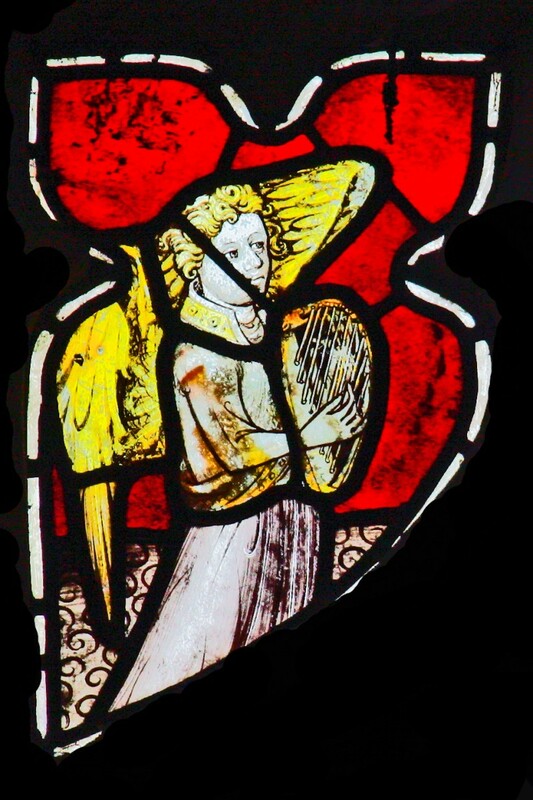 Shown holding a harp or lyre. Music to praise God. This is one of the Virtues who normally are shown carrying a pyx or censer. 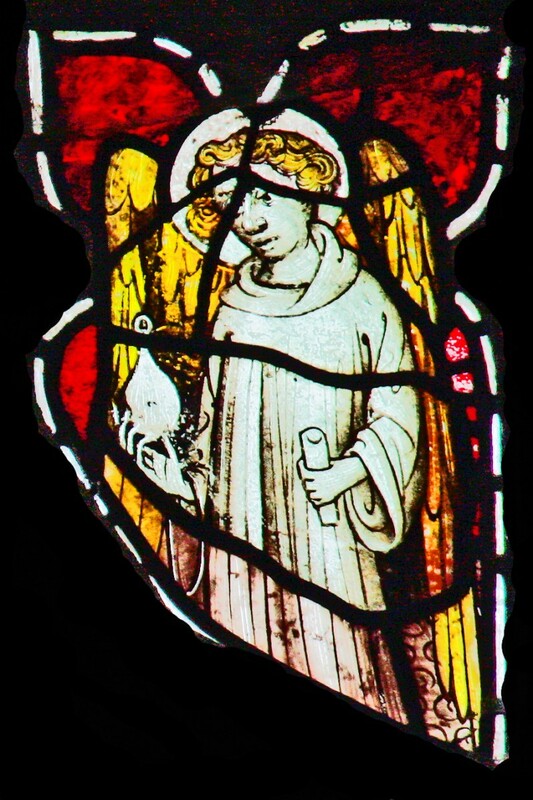 Urine flasks were associated with the medical profession in the Middle Ages and this may indicate the powers of Angels to perform healing and miracles. The lowest order and God's messangers to man. These are 6 winged angels with 2 to cover their faces, 2 cover their feet and two to fly. 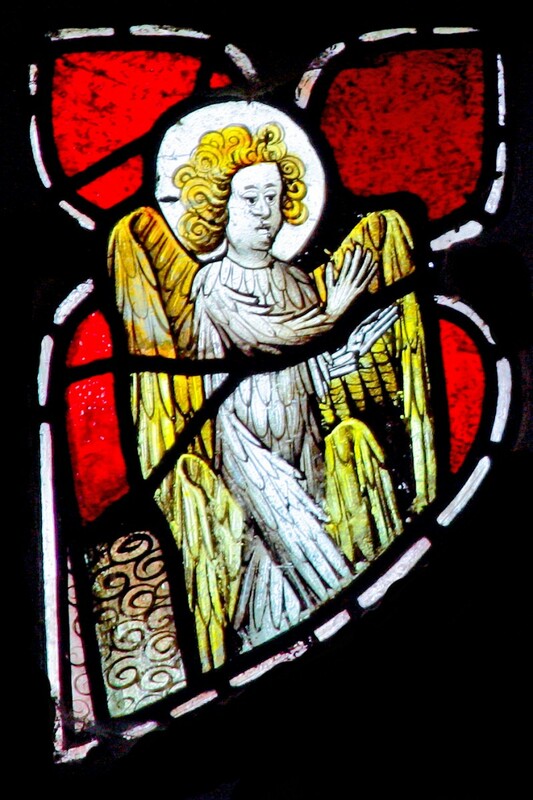 There are some very high definition pictures and more information on the windows on Norfolk Stained Glass's web site : http://www.norfolkstainedglass.co.uk/Harpley/home.shtm. click here.